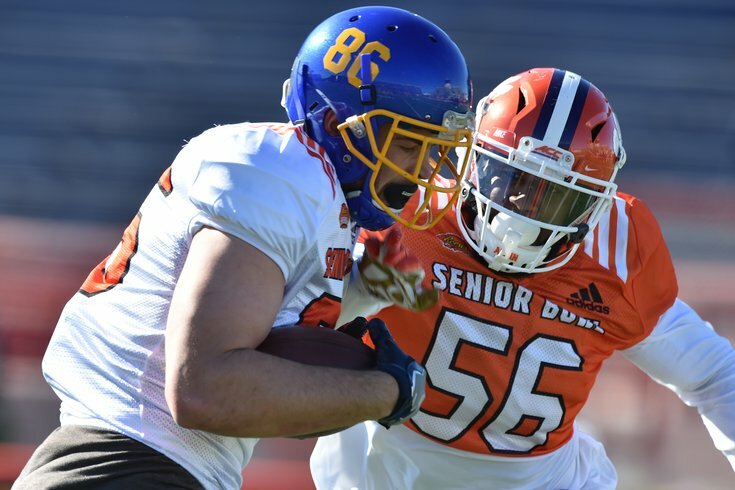 South Squad tight end Dallas Goedert of South Dakota St. (86) catches a pass against inside linebacker Dorian O'Daniel of Clemson (56) during Senior Bowl practice at Ladd-Peebles Stadium. Dallas Goedert is proud of his name. But as a Philadelphia Eagle, he may feel some extra pressure to perform, especially against the Cowboys. "I feel like if I have the career I think I'm going to have, I think they’ll forgive me," the Eagles' second round draft pick said Friday walking off the field after his first mini camp practice. Goedert, who scored seven touchdowns for South Dakota State last year while tallying his second straight 1,000 yard season, has been dropped into the most ideal situation imaginable. The Eagles are defending Super Bowl champions, have a winning culture and have one of the best tight ends in the NFL at the top of the depth chart. Goedert has the opportunity to win, to learn from the best, and to actually contribute on the field in the Eagles offense. "Coming to Philly, the defensing Super Bowl champs they have high expectations and they’ll put that on you," Goedert said. "I have Ertz ahead of me but they run a lot of two tight end sets." "It's really cool, they won the Super Bowl last year they have something going for them. I am ready to buy in... After this rookie mini camp I will spend more time with [Ertz], I am excited to pick his brain a bit." Spend just a couple seconds with Goedert and you'll interact with an upbeat and positive guy. And why wouldn't he be? The big 6-foot-5, 255 pounder is getting paid to play the sport he loves. "It’s a dream come true," he said. "It probably hasn’t hit me yet, but playing in the NFL has been a dream of mine since I was a kid." As the Eagles' highest draft choice, Goedert is all but assured to be on the field against the Falcons in Week 1, an expectation that probably isn't true for the rest of the Eagles' five draft picks, four of whom were selected in the final four rounds. Sprinting onto Lincoln Financial Field in September will be the realization of a lifelong dream for Goedert. "I can't even imagine it's going to be such a rush with so much adrenaline," Goedert said. "I will probably black out for a minutes there, it will be an overwhelming experience."